Don’t let this be you tomorrow! I cannot believe the time change is already here. BUT, I guess that means we’re that much closer to Spring and outdoor activities. I kid you not, I am STILL surrounded by mountains of snow but the sun has been shining here and there (although I think it’s supposed to snow again today *sigh*) and I’m dreaming of warmer weather. 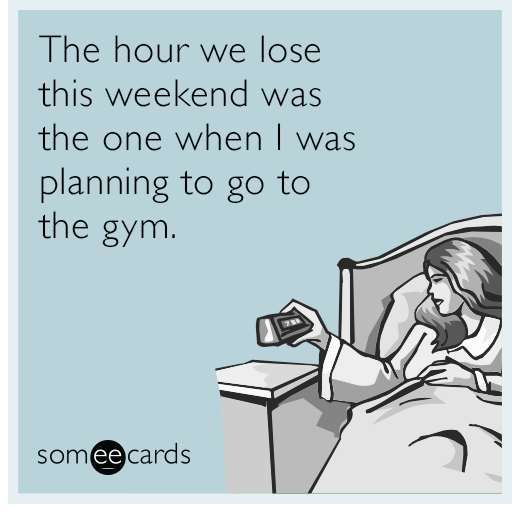 So, even though we’re losing that hour tomorrow, be sure to make the make the effort to fit that workout in.